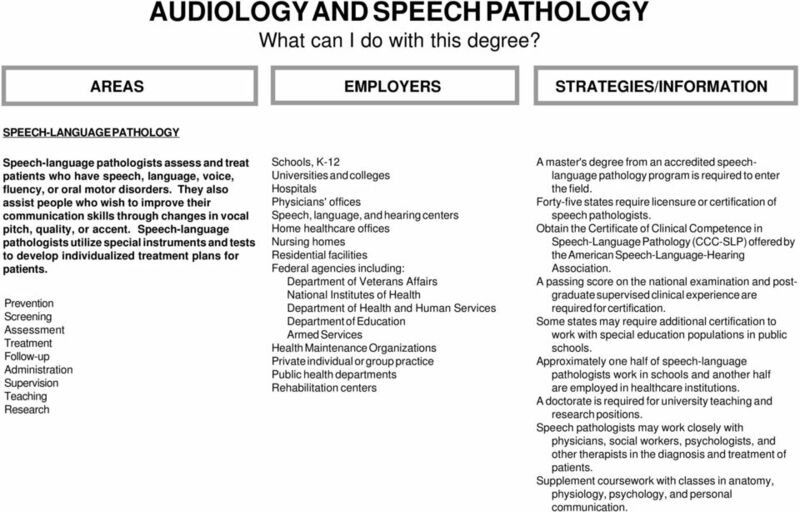 Download "AUDIOLOGY AND SPEECH PATHOLOGY What can I do with this degree?" 1 AUDIOLOGY AND SPEECH PATHOLOGY What can I do with this degree? STRATEGIES/INFORMATION SPEECH-LANGUAGE PATHOLOGY Speech-language pathologists assess and treat patients who have speech, language, voice, fluency, or oral motor disorders. They also assist people who wish to improve their communication skills through changes in vocal pitch, quality, or accent. Speech-language pathologists utilize special instruments and tests to develop individualized treatment plans for A master's degree from an accredited speechlanguage pathology program is required to enter the field. Forty-five states require licensure or certification of speech pathologists. Obtain the Certificate of Clinical Competence in Speech-Language Pathology (CCC-SLP) offered by the American Speech-Language-Hearing Association. A passing score on the national examination and postgraduate supervised clinical experience are required for certification. Some states may require additional certification to work with special education populations in public schools. Approximately one half of speech-language pathologists work in schools and another half are employed in healthcare institutions. A doctorate is required for university teaching and research positions. Speech pathologists may work closely with physicians, social workers, psychologists, and other therapists in the diagnosis and treatment of Supplement coursework with classes in anatomy, physiology, psychology, and personal communication. 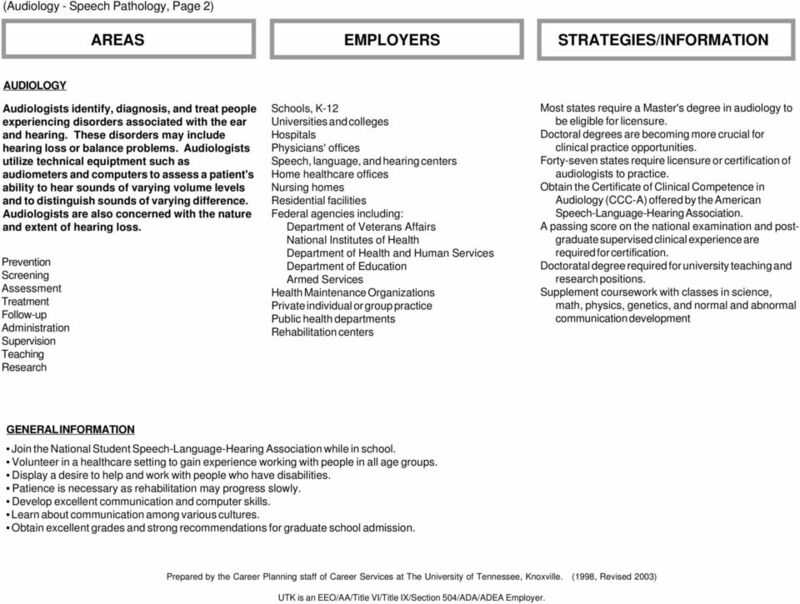 2 (Audiology - Speech Pathology, Page 2) STRATEGIES/INFORMATION AUDIOLOGY Audiologists identify, diagnosis, and treat people experiencing disorders associated with the ear and hearing. These disorders may include hearing loss or balance problems. Audiologists utilize technical equiptment such as audiometers and computers to assess a patient's ability to hear sounds of varying volume levels and to distinguish sounds of varying difference. Audiologists are also concerned with the nature and extent of hearing loss. 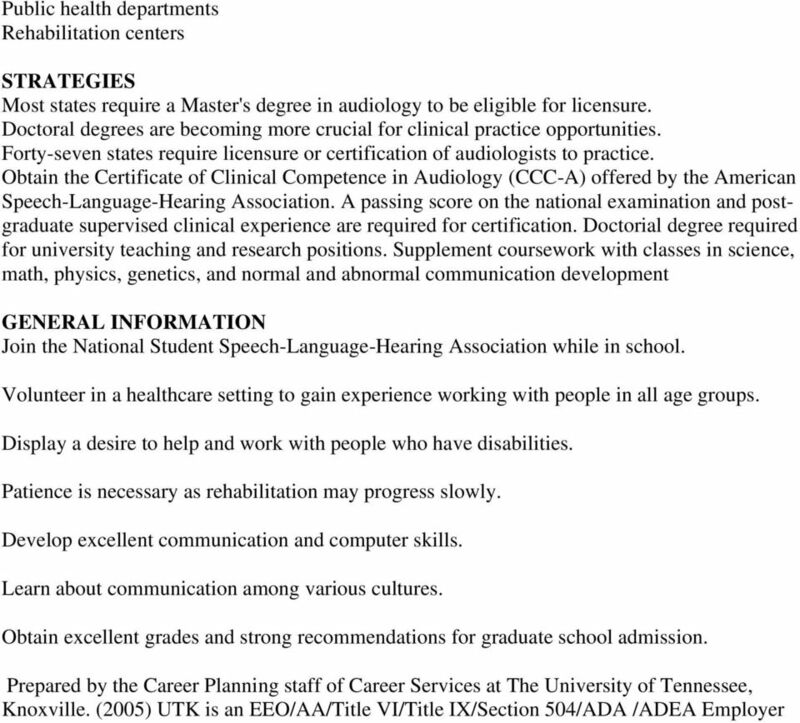 Most states require a Master's degree in audiology to be eligible for licensure. Doctoral degrees are becoming more crucial for clinical practice opportunities. Forty-seven states require licensure or certification of audiologists to practice. Obtain the Certificate of Clinical Competence in Audiology (CCC-A) offered by the American Speech-Language-Hearing Association. A passing score on the national examination and postgraduate supervised clinical experience are required for certification. Doctoratal degree required for university teaching and research positions. Supplement coursework with classes in science, math, physics, genetics, and normal and abnormal communication development GENERAL INFORMATION Join the National Student Speech-Language-Hearing Association while in school. Volunteer in a healthcare setting to gain experience working with people in all age groups. Display a desire to help and work with people who have disabilities. Patience is necessary as rehabilitation may progress slowly. Develop excellent communication and computer skills. Learn about communication among various cultures. Obtain excellent grades and strong recommendations for graduate school admission. Prepared by the Career Planning staff of Career Services at The University of Tennessee, Knoxville. (1998, Revised 2003) UTK is an EEO/AA/Title VI/Title IX/Section 504/ADA/ADEA Employer. 4 STRATEGIES A master's degree from an accredited speech-language pathology program is required to enter the field. 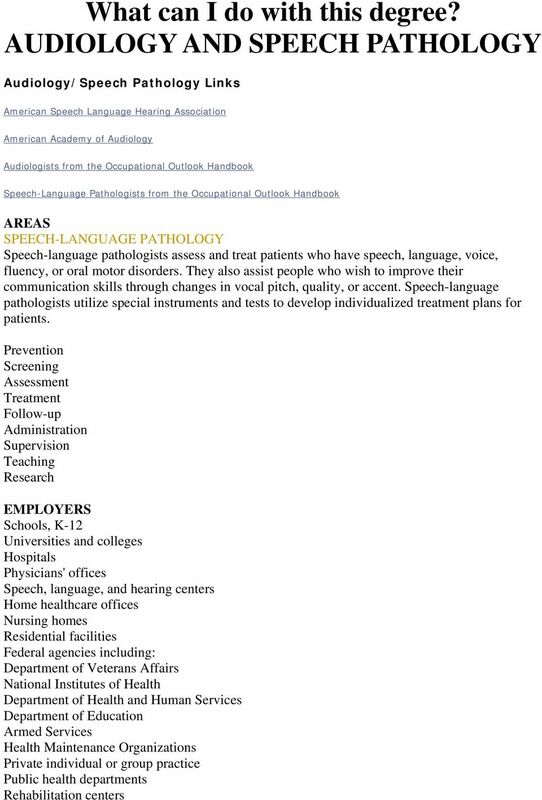 Forty-five states require licensure or certification of speech pathologists. Obtain the Certificate of Clinical Competence in Speech-Language Pathology (CCC-SLP) offered by the American Speech-Language-Hearing Association. A passing score on the national examination and post-graduate supervised clinical experience are required for certification. Some states may require additional certification to work with special education populations in public schools. Approximately one half of speech-language pathologists work in schools and another half are employed in healthcare institutions. A doctorate is required for university teaching and research positions. Speech pathologists may work closely with physicians, social workers, psychologists, and other therapists in the diagnosis and treatment of Supplement coursework with classes in anatomy, physiology, psychology, and personal communication. 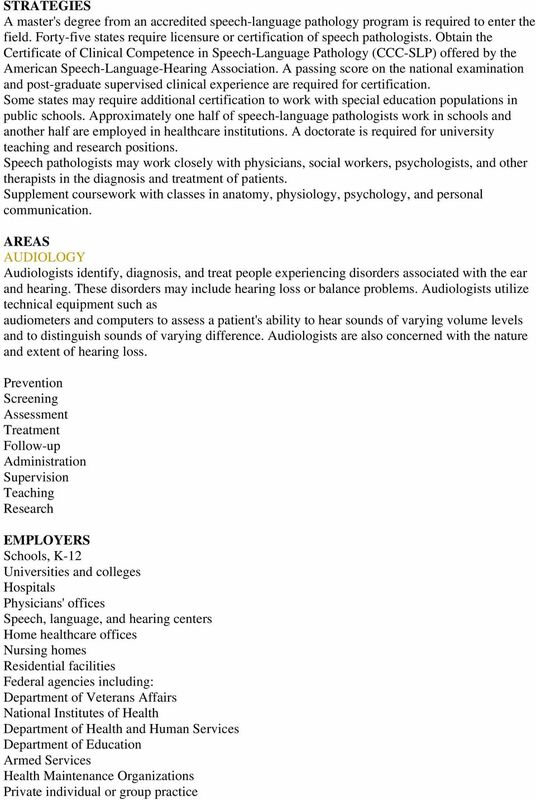 AUDIOLOGY Audiologists identify, diagnosis, and treat people experiencing disorders associated with the ear and hearing. These disorders may include hearing loss or balance problems. Audiologists utilize technical equipment such as audiometers and computers to assess a patient's ability to hear sounds of varying volume levels and to distinguish sounds of varying difference. Audiologists are also concerned with the nature and extent of hearing loss. Welcome to the Physical Therapist Assistant Program. You have begun the exploration of a profession dedicated to restoring individuals following injury or disease to full participation in their daily activities.